The topic will focus on signs related to scripture and a Cross of Light which has appeared on the residence of Mr. Lenar in Mine Hill, NJ, during Holy Week of 2012. Fr. 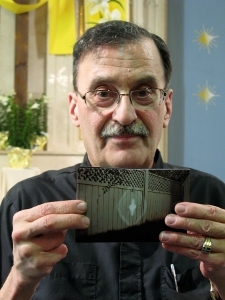 Tartaglia photographed the image on Good Friday and confirmed the sign. May 5, 2012 - PRLog -- Fr. Richard Tartaglia and Loci B. Lenar of St. Mary's Parish (Denville, NJ) are scheduled to speak live on the Catholic radio show, Sacred Treasures, on Monday, May 7, 2012. The topic of conversation will focus on signs connected to scripture and a Cross of Light that has appeared on the residence of Mr. Lenar in Mine Hill, NJ, during Lent and Holy Week of 2012. During a prayer service held at St. Mary's Church on Thursday, April 19, Fr. Tartaglia spoke about the cross of light in his Homily. The Catholic church is located on Myers Avenue, Denville, New Jersey, USA. Fr. Martin Glynn is the head pastor of St. Mary's. Other guests invited to speak on Radio Maria include Margarita Rodriguez who was healed during a Rosary that she was leading when a seer, Ivan Dragicevic of Medjugorje, came to St. Brendan Catholic Church in Miami, Florida. Sacred Treasures is hosted by Kathie Duggan and is broadcasted live on Monday's by Radio Maria, US, between the hours of 2:00-3:00 PM (Central Time), and 3:00-4:00 PM (Eastern Time). Fr. Tartaglia and Mr. Lenar are scheduled to speak during the second half of the show on Monday, May 7. Radio Maria is a tool of evangelization which serves the Catholic Church in the United States and is a radio network committed to calling for conversion through programming which offers plenty of space for prayer, catechism and human development.